Welcome to our CHA Winter 2013 Sneak Peek Week! We can't beleive CHA is right around the corner..it's two weeks earlier than normal so we're busy busy busy behind the scenes getting everything ready to go, but we couldn't go to CHA without having our popular sneak peek week on our blog - so join us for the next week as we reveal our latest collections, have fun giveaways and make some very exciting announcements that you don't want to miss! We have so many exciting things to show you in our first reveal - from a NEW collection, NEW packaging and NEW embellishments to a simply wonderful NEW partnership with an amazing company that's going to make it even easier to share your story with Simple Stories products...check it out! See our beautiful new packaging - we love the new look! Our 6x6 pads are now 24 double-sided pages and include our Simple Basics patterns - how perfect is that? Hmmmmm...did you notice something NEW to the mix? We are THRILLED to introduce embellishment add ons to our collection - 6x12 chipboard stickers, decorative brads and layered stickers. So FUN and perfect for adding that extra touch to your elements, cards and pages! You will LOVE them!! We've mixed things up a bit with this release - and have 6 full double-sided patterned designer cardstock patterns - then we added 3x4 elements to our assortment of signature elements so you have a large assortment of different element options - remember you simply trim elements and insert into divided pocket pages for quick and easy scrapbooking! Remember these adorable Sn@p pockets in 3x4, 4x6 and 6x8 sizes? We have new coordinating 24/Seven pockets so you can easily add to your pages, album or insert into divided page pockets for quick and easy scrapbooking! Intruducing our NEW Sn@p journal pages that fit perfectly in our 6x8 Sn@p albums. We've added new die-cut pages to the mix that are simply AMAZING - so now you get a total of 12 pages, including 6 die-cut pages. Your Sn@p albums will never be more simple and beautiful! Not only do we have the decorative element cards in our main collection, we now have an exciting new set of Sn@p cards that you're going to love! With 16 4x6 and 16 3x4 double-sided cards - our new Sn@p pads offer a simpler option for your title and journaling cards with bright and bold fronts and patterned backs! For one last reveal today - we're beyond thrilled to announce that Simple Stories and Scrapbook Generation has joined forces to introduce an exclusive idea book, Sketch Fusion with Simple Stories, featuring all-new sketch blueprints that blend perfectly with the unique format of Simple Stories papers and signature elements for quick and creative scrapbooking! Fresh from the popular creative duo at Scrapbook Generation, Allison Davis and Debbie Sanders, Sketch Fusion with Simple Stories, showcases 24 fun and functional sketches along with 24 beautiful full-color layout examples. With exact measurements and positions of photos, papers and elements, Sketch Fusion is a must-have resource, showing you just how easy it is to create traditional layouts with the innovative Simple Stories products! Now's the fun part - we're giving away one 24/Seven collection goodie pack and one Sketch Fusion book. Simply let us know what you think by posting a comment and you'll be entered to win! We'll leave comments open until January 16 and announce the lucky winner on January 17! Loving the color palate and all the versatile patterns in this new collection! Oh my goodness!! Love everything about this! The colors, the fun icons, the patterns...so perfect for girl or boy layouts! Thanks for the chance! So TOTALLY Awesome!! I was thrilled to pieces seeing the papers and joining SG....well that's like the big huge cherry on top with whipped cream! The papers and cards...like the ice cream, nuts, chocolate, strawberry sauce and bananas all rolled up in one! SOOOO inspiring! I love this new collections! Great colors and graphics. Love the colors in this new collection and would love to include it in my Project Life 2013! Very fun! O M G just looooove it! the colors, the patterns, all the little details! just awesome! absolutely want it! could you please consoder going digital too? :) thank you for the chance to win it! O M G just looooove it! the colors, the patterns, all the little details! just awesome! absolutely want it! could you please consider going digital too? :) thank you for the chance to win it! This is such a fab collection!!! I love to scrap the everyday, and this would be a perfect match!!! Again, SS will be my first choice. Love the double sided 6x6, those pockets and journaling cards. The patterns, the colors---oh I could go on and on. I use SS so much in my Project Life scrapbook. Great collection, and I'm really liking that 6x6 pad! It would be wonderful to win a book of SG sketches...I use them all the time! This combo is better than peanut butter and chocolate!!!! Simple Stories is my favorite scrap company, and you add Scrapbook Generations to the mix ? SWOON! Wow, the new year is off with a bang! Simple Stories, I fell in love with Sn@p, and now you have won me over again! I love absolutely everything in the new 24/7 line! Oh my gosh! I cannot wait until it's released! Love the papers. Having a SG sketch book to go with it, would be the best! Smart thinking on your part. This collection is so awesome! The colours are so pretty and happy and make this collection perfect for so many occasions. I'm soooo in love with these colors! Adoreable! this collection is fabulous!! so SO many possibilities!! love the colors! Love the new collection! I am so excited about the partnership with SG. I have several of Alison's sketch books. I can't wait to get this one! LOVE it all, but especially love the 3x4 and 4x6 cards! Thanks for the chance to win! Wow! I absolutely love this collection, can't wait for it to hit the shops! Awesome collaboration! Scrapbook Generation is my Local store and those ladies are amazing. Your lines are amazing also, once again thank you for making scrapping so easy. You have outdone yourselves! As I scrolled through the new product I thought I will never be able to pick just some of it. Can't wait for the release and to see what else is coming. The combo of Simple Stories and Scrapbook Generation has me smiling! This will totally step up my grandsons' books! So excited about the product and layout book! I will be getting one as soon as it comes out!!! OMG!! I soooo love this kit!!! I've been trying to figure out what I wanted to use for my 2013 Album and when I saw this post I instantly thought PROBLEM SOLVED!!! :-) Needless to say I've already done some searching to see if it was available to purchase. Thank you Simple Stories for once again giving me the products I need to make wonderful pages to capture my family's memories. The new colors are just BEAUTIFUL! To top it off, joining up with SG, how AWESOME!! Love it! I think the yellow chevron/hexagon paper is my favorite! This is awesome! I love the new collection but am most excited about the partnership with Scrapbook Generation. It is an awesome store, great family and love their sketches. I am happy! OH my I LOVE, LOVE, LOVE this collection! The patterns, colors, images, everything is just so fabulous! I am hoping to do my first Project Life and these would be perfect! Love Love Love It!!! Can't wait till its out and I can get it. My new scrapbook "staple"!! :-) Thanks for making scrapbooking "Simple" in my busy life!! SOLD!!! What a fun color pallet, the options look endless and I'm a SG local girl too and can't wait for the book it is sure to be awesome!!! Congrats! oh my-- this is lovely. It's my first year of doing Project Life and I am SO excited! OMG---WOW!!! I'm stunned!This is great! LOVING this new line! It's kind of like a fun mix between the traditional Simple Stories lines and the Sn@p products, I'm loving all the embellishments and love the chances to the 6x6 pad! I love it!! all of it!! Simple. Loe it all! Can't wait for the release! Oh my goodness you have nailed it with this collection! The collaboration with SGD is going to be awesome!!! Love the colors...amazing lines. Once again...WOW!!! Love it! Perfect for both Project Life and traditional scrapbooking! I am in love with this new collection! The colors are fantastic and the graphics are off the hook! I cannot wait to get my hands on them for my regular scrapping and project life. I am not usually a book buyer but Simple Stories and Allison Davis together? I am there! Can't wait to get one of those! Thanks for the chance to win some of these fabulous new products. OMG...what an awesome collection!! Love it all!! What a fun collection! Love the colors and what fun elements! The new collection looks great! And the new books will be wonderful! I LOVE this collection! I cannot wait to buy it! So excited to hear this news ... a great combination between two awesome companies! This totally rocks! When I use your papers, I know that my layout is gonnna look great and be easy to put together...I bet having some new sketches to use would add to the fun! AND> I really love the colors in 24seven! This new collection is GORGEOUS!!! I can't wait to play with all of the new elements, like the brads and the chipboard stickers! Such fun colors and designs!!! Oh mercy - this line is amazing!! You just keep releasing the most beautiful pretties!!! This line is a must have - and to get it with the SG sketches would be awesome!!! Thanks SS!! Love the new collection and cannot wait for the Scrapbook Generations book! Oh man!! Yes please! I WANT IT ALL!!!! This collection is wonderful! Looking forward to adding it to my stash. What a great combination - Simple Stories and Scrapbook Generation!! Can't wait to see the new collections as well as the book! Love the 24/7 color combo and the fact that you've added embellishments to the collection pack. I'm liking this collection! These are great, fun colors and phrases. SS and SG seem like a cool match up! OMGorgeous stuff!!! Seriously, Im gonna need every. single. piece. Cant wait for the release!!! Love the colors and all the different pieces--so much fun! I love the colors and patterns in this 24/7 line - and I love the name, too! For those who do traditional scrapbooking, the new book will be a great bonus! Love the colors and all of the stickers!! This is exciting! I can't wait to get started! This is a great collection. I love the new journal pages. I have not yet jumped onto the project life wagon; however, your products are great for all kinds of projects. Thank you for the chance to win. Unbelieveable! Every detail covered with a fantastic array of colours and patterns. The fusion represented in the books is mouthwatering too! Thank you. ok...the new collection is amazing! I love everything...especially the new embellies. I can not wait to be able to get my hands on some. I already have a project in mind...lol...this is going to be perfect for my project life album! Yahoo! Adore the colors in this collection! The sn@p diecut papers are amazing! Thanks for the chance to win!! This is such a fun collection! I love all the elements to it and I especially love the sn@p elements! I can't wait for the release! love the primary color pallet. could prob just create with the simple basics papers for years to come due to the versatility. you guys continue to amaze! O-M-G!!! I am new to the scrap/crafting world and have been getting to know each brand while building up my stash for this awesome, new addiction! I must say, especially after seeing this release that Simple Stories has got to be one of my absolute top favorites!! I would just LOVE to win this!! The colors, the textures, the versatility is just sheer genius! I can see that so much thought had to have gone into this line (like all the others I’ve seen from SS). I want to buy 2 of everthing! Great job!! Wonderful collection. 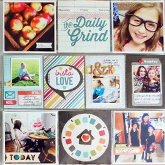 Love the idea of the collaboration with Scrapbook Generation. Thanks for the giveaway! LOVE the versatility of this collection. It will work with Project Life or conventional scrapbooking. My favorite is the bingo cards! You never fail with your collections and I adore all of this, and I am especially excited about the idea book! Oh wow, just simply got to have it ALL!! Love the new embellishment additions! LOVE the cork background with this line!!! I think my favorite thing is all of the cute embellies that go with it: chipboard, sticker, pockets, journaling cards! I LOVE IT ALL!!! AND, Allison Davis??? WOW. That's a MUST HAVE book for sure!!!! I don't know how you do it, but each one is better and better. "This is my favorite!" is all I can say about it that says it all. I love the idea of a sketch book too. So many customers ask to see something. Yay! LOVE it! what a FABULOUS collection!! I have never heard of SG, but sounds fun! What do I think, I think the colors, designs and a new sketch book are fabulous. Seriously, great first peek. I am so excited to see you paired up with Scrapbook Generation! Love their sketches and they always seem to be perfect with your products! Love the new collection. Love that is pairs nicely with Sn@p! Thanks for the chance to win! Love the look of this line. Would prefer that you didnt hole punch the "SN@P" pages! Love this collection! Perfect for documenting the daily-24/7 stuff of life. I think I will have to have the whole collection! Oh no! My wallet isn't happy with me! I absolutely adore this collection! It fits with the palette I am working with for this years album, and the addition of a few more colors (red) will just help me to mix things up a little. Love! This is simply fabulous! Love the colors and new embellishments! Love, love, love! Love Simple Stories, and Scrapbook Generation! With this collection I especially love the cameras! Wow! I love the combination of colors you used for this collection and how this collection could be used for anything/any event! The cork board paper is to cute! LOVE the colors in this collection and could see using this in a huge variety of ways! I love the full sheets of patterned paper!!!!!! I often use a full sheet of pattern as my background so this is perfect for me! Loving the new sketch book too, I <3 SG books! the colors in this collection are fabulous! Love this combo of colors and patterns! Simple Stories has done it again! Wow! Another great line from Simple Stories!! I love the new embellishments and the new colors, looking forward to a simple scrapbook using the grids and the new layout ideas. Thanks so much! I just died and went to heaven... I've been a scrapbooker for 7 years (well I think I was born a scrapbooker really... have always jotted notes and kept "stuff")... maybe I should say 7 years of product addiction... and this collection my dear Simple Stories Team is THE BEST thing I have ever seen... I haven't been this excited about scrapping since I discovered online forums! Seriously, DIED. AND. WENT. TO. HEAVEN.